The Kalenji Pack has been sent back to Decathlon store. Still feel a bit sad about it. Now I own a HPL #759 from Nathan. Even though this pack is from around 2007 and the version I have now was redesigned in 2009 I have not yet come across this one (neither on the web nor on a race). Of course so far I was not really looking for something that would allow for some self-supported long run ... very long run. Now this pack is not really available anymore and even though it is old I was able to purchase one at runmarkt.de. Actually I have not yet figured out what is meant by the two bottle holder positions and how to adjust or change respectively them. Also need to get used to the "Compression Wings". 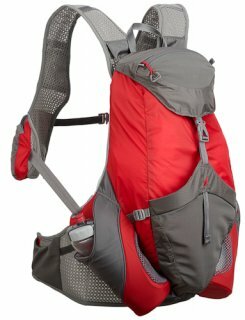 So after some miles of more serious trail running with the HPL #759 I know that the angled position is indeed easier to access but if the pack is really loaded to its limit including the 3L hydration bladder the top of the bottles really rub and hurt my back because the lower part of the holster tend to point more to the outside of the pack. Since I got also other stuff to do I gave up not before writing an email to Nathan asking for help. Bottle in "horizontal" position. This is where you could add a few more items into the other opening of the holster. It is indeed difficult to get the bottles in and out while running but it does work and in this position the bottles can't bounce on your back. So this one has plenty of space for all kind of stuff. I particularly like the shoulder strap pockets (well I'm used to those from the HPL #008). The 3l Platypus Hoser which I originally purchased for the Kalenji does fit nicely into the #759. Besides the bottle holster issue I personally dislike that the pack (at least if fully loaded) sits a bit to low on the back. Will see how to works for really long runs. Q: So why do I buy an basically outdated pack? A: Because it seems just the right pack for me and my current needs and I'm satisfied with Nathans products and its quality. A: The closest match to this one now seems to be the Fastpack from UltrAspire which is not too surprising since Bryce Thatcher has designed both of them or at least was involved. Another alternative would be the Salomon Advanced Skin Slab 12 (needs extra shoulder strap bottle holders and has small bladder 1.5l). Q: Why didn't I go with the Fastpack then? A: It seems not yet available and its not yet clear to me how the support for hydration bladder looks like. 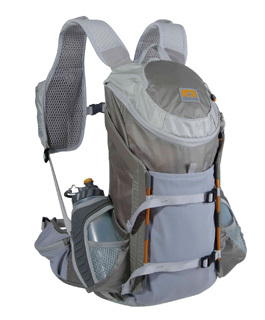 I now have a confirmation from UltrAspire that the Fastpack has hydration bladder support and a 3l reservoir will fit into it. The Fastpack should be available in Europe/Germany about end of August 2012. I think I would really like to get my hands on one of those once it's available. The motivation for this review is basically based on the need for a new hydration backpack. So far I could get along with the somewhat minimal HPL #008 from Nathan. It has a 1.5 liter bladder and two front pockets which I find very useful and would not wanna miss on any future replacement. Basically it's kind of a replacement for a waist belt since it does not offer very much space for additional items to carry but it is much more convenient to wear, especially for long runs such as 100k or even 100miles. So what I was looking for is a similar lightweight pack that can hold at least 3 liter or more of water, has shoulder strap bottle holders, front pockets, and around 10l-20l of space for my stuff (food, phone, first aid, some cloths). At some point I came across the "Water Bag Large" from Kalenji which I bought from Decathlon. The fit of this vest-style pack is quite comfortable, even with two filled 700ml water bottles and the 2l bladder it does not bounce too much. It could be a little bit bigger in size to hold a few more items and maybe a bigger bladder. I will try if it can hold a 2.5l or 3l water bladder without loosing too much space elsewhere. The pack features some compression system which might not really be necessary given its size. But this can be useful to attach some stuff like a light rain jacket or other stuff on the outside of the pack. Underneath each bottle holder are two zipper pockets to hold some gel or alike. I find those zippers a bit difficult to open and close. Especially if you have a bottle inside the holder it is also a bit tricky to get stuff in and out of those pockets but they are still very good to have. What I'm not sure about the the large front zipper to open and close the vest if you put the pack on. In general this works well but somehow it looks like it would not last too long but I could be wrong. The bladder is located right next to your back and this bladder pocket has a Velcro strap. Besides this pocket there's two more, one which you open at the side of the pack with a zipper. This one actually has a hole for a bladder hose as well. And there is another pocket at the back of the pack also with a zipper. Last but not least this back pocket contains a small "waterproof" pocket e.g. for a phone. As a replacement for the 2l hydration bladder that comes with the pack I now bought the 3l version of the Platypus Hoser.